rVetLink is your online portal to access patient records. How do I use rVetLink? If we have your email address, an email is sent at discharge. The email has an embedded, secure link that will take you directly to your patient’s file. You can see your current patient. In addition, you can now look up all your other patients, searchable back the previous 12 calendar months. How do I login if I don’t have the email link? You were provided a unique user name and default password at the rVetLink launch. If you don’t know your user name, simply click “User Name Help” on the login screen. Fax-only recipients will receive the cover letter containing information to log into our website and subsequently, the rVetLink portal. The discharge order document will follow the cover letter. Update notifications will also be faxed, unless you log on to rVetLink to change your profile and settings. Can I view the finalized lab work or other documents while my patient is still hospitalized? As long as your patient is still checked in, finalized reports are not visible. Once your patient checks out and rVetLink updates, you will be able to access your patient’s reports. We make every effort to inform you of your patient’s status in a timely manner. 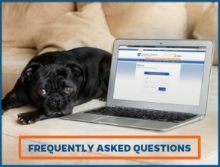 The rVetLink database updates every two hours, at which time a change in patient status is checked. If your patient is deceased, a notification is sent based on your preferences. By default, a deceased notice is sent via both email and fax. I can’t find records for a past patient. You might not be listed in our operating system as the patient’s RDVM. If that’s the case, your client can simply call us to add your name to their pet’s file. Please note, patient records are available 12 months retroactively from current date via the rVetLink portal. If you need archived records please visit: Medical Records Request .